More than three and a half hours on stage! Yes, that is the longest concert by one band that I have ever attended. 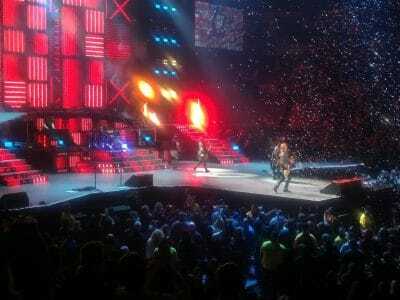 Guns N’ Roses played, and played, and played at the Air Canada Centre to the tune of about 30 songs. 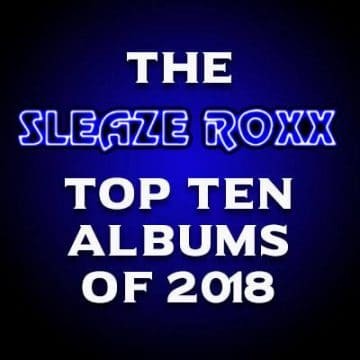 While some may say that they got more than their money’s worth due to the length of Guns N’ Roses‘ set, I left disappointed once again after seeing the “reunited” version of the kings of sleaze rock featuring singer Axl Rose, lead guitarist Slash and bassist Duff McKagan. Luckily, this time around, I had a free concert ticket courtesy of my long-time friend Chris (thank you Chris!) so at least I didn’t feel ripped off in the process. 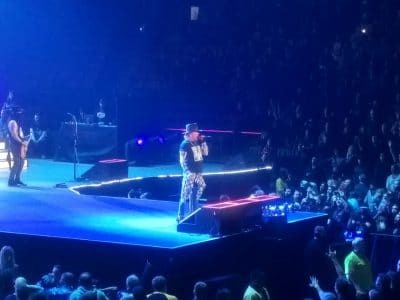 I have two main issues with Guns N’ Roses‘ set during their second of two nights in a row at the Air Canada Centre in Toronto. 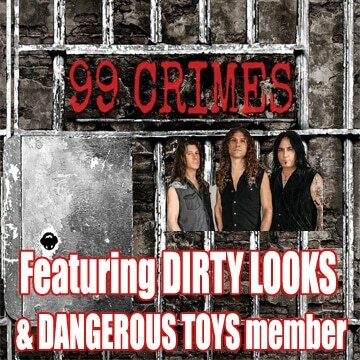 My first issue is the setlist. Unless you’re The Beatles or KISS, and have released so many great albums that you have a lot of material to pull from, there are bound to be some slower or even dull moments in a set since most bands don’t have enough great songs to fill three and a half hours. While there’s no doubt that at least half of Guns N’ Roses‘ studio albums are good (G N’ R Lies, Use Your Illusion I and Use Your Illusion II) with one absolutely stellar album (Appetite For Destruction), the band has also released a couple of duds (The Spaghetti Incident? 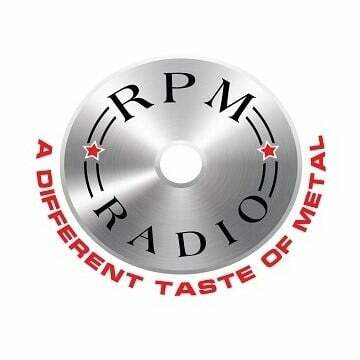 and Chinese Democracy). Someone close to the Guns N’ Roses camp (or more particularly Axl Rose) needs to tell them that the great majority of their fans (I am making an assumption here) do not want to hear much if anything from Chinese Democracy. I don’t even consider Chinese Democracy as a Guns N’ Roses album! Let’s face it. It was an Axl Rose solo album. So why in the hell would Guns N’ Roses with Slash and McKagan in the line-up play — wait for it — six songs from Chinese Democracy? It makes no sense. You could feel the wind and excitement of the crowd sucked back in every time that Guns N’ Roses played a song from that album. To put things in perspective, Guns N’ Roses played eight songs (out of 12) from their 30 million plus selling album masterpiece Appetite For Destruction, five songs (out of 16) from their 16 million plus selling Use Your Illusion I record, five songs (out of 14) from their 14 million plus selling Use Your Illusion II album, only two songs (out of eight) from G N’ R Lies, one song (out of 13) from The Spaghetti Incident? (thank God!) 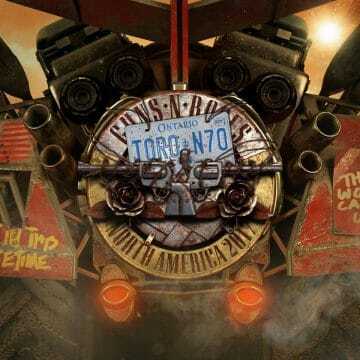 and a whopping six (out of 13) tracks from Chinese Democracy. I think most people will agree that the rule of thumb is to play the most songs live from your most popular successful albums. That’s why former Skid Row lead vocalist Sebastian Bach played six songs from Skid Row‘s self-titled debut album when he last played in Toronto in November 2016. 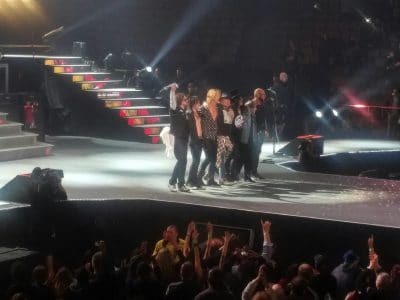 Nevertheless, here were Guns N’ Roses force feeding the crowd with six songs from Chinese Democracy including two during the encore segment of the show. What a huge mistake. Guns N’ Roses could have easily cut all six songs and likely no one would have cared. In addition, the covers that Guns N’ Roses played that had yet to surface on a studio album were mostly on the dull side. A cover of Jimmy Webb‘s “Wichita Linesmen”? Really? Who listens to Webb in the audience? Another momentum killer where you felt the wind get sucked out of the crowd. Guns N’ Roses‘ cover of Soundgarden‘s “Black Hole Sun” felt uninspired. And that leads me to my second other main issue with Guns N’ Roses‘ concert on this night. Uploaded by drbrooker on 2017-10-31. 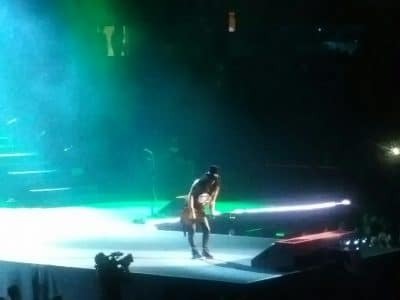 Aside from a few other very short comments to the audience such as there was going to be an interlude (when McKagan sang lead vocals on the Misfits cover “Attitude”), Rose stated pretty much nothing to the Toronto audience. Nothing about Chris Cornell dying which presumably prompted Guns N’ Roses to cover Soundgarden‘s “Black Hole Sun.” I get that the enigmatic singer is seemingly kind of shy and stuff but the lack of interaction between Rose and the crowd was a huge missed opportunity. All Rose had to do was raise his arms and he could get a huge pop from the audience yet he failed to engage / connect with the audience over and over again. Having seen two veteran Canadian acts play live the week before (Helix and Lee Aaron — concert review still to come) where both of the bands’ respective leaders (Brian Vollmer and Lee Aaron) regaled the audience with one short story after another, it would have been amazing to hear Rose share some stories from the past involving Slash and McKagan. And how about Rose engaging the audience to sing along? This only seemingly occurred during “Knockin’ On Heaven’s Door” and was rather short lived in that regard. Perhaps I have just been spoiled going to Steel Panther concerts where I can feel a myriad of emotions (mostly laughter) while listening to the banter between guitarist Satchel and singer Michael Starr between songs. What I would really like to see from Guns N’ Roses is a much shorter set where they drop the boring stuff that isn’t seemingly connecting with fans such as anything off Chinese Democracy and all those needless covers that are not already on one of their albums. Guns N’ Roses could easily trim their set to 20 killer songs that would keep the audience level up at a fever pitch almost the entire time. Rather than that, Guns N’ Roses played a long marathon set that had some highs but also many lows filled with many boring and unknown songs. Overall, while I was glad that I was able to see Guns N’ Roses play live again, I left thinking how the group could have delivered a truly killer set but rather chose to deliver a rather uninspired marathon set.